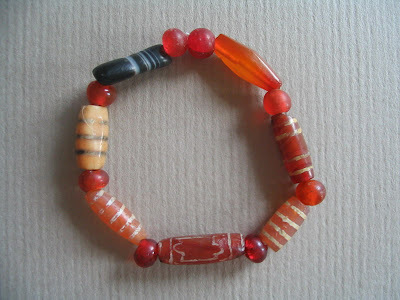 Another favourite bracelet, this time made of etched carnelian beads mostly from Burma. Locals here call these beads "xian zhu" or fairy beads and they are believed to be related to "tian zhu" or heavenly beads, which Westerners and Tibetans call "dZi". These beads are at least a few hundred to a thousand years old. The red spacer beads are made of old glass from Vietnam. All the beads were purchased separately and I had to wait a long time to put together this bracelet. As I was still short, I have included one plain faceted carnelian and one black banded agate to make up the whole piece. This bracelet composed in 2005. Hello it's me, I am also visiting this website on a regular basis, this web page is in fact fastidious and the visitors are genuinely sharing good thoughts.